New research has shown that using “magic mushrooms” might rewire the brain, leading people to have entirely new experiences. The brain builds pathways over the course of a lifetime, and strengthens those pathways every time it uses one. That means that people tend to get into a rut of having the same thought cycles many times over. Many parts of the brain are not directly connected to each other. Thoughts, memories, and ideas in the different regions are not linked together, so they operate relatively independently. Some of the most creative people have had unusually structured brains so they connect different parts of the brains. Typically, brain pathways don’t change. However, when someone ingests mushrooms, that can change. The main ingredient in psychedelic mushrooms is psilocybin. This drug has been shown to create new neural pathways between brain regions that were previously unconnected. That’s what leads to things like seeing music or hearing numbers. In one study, researchers gave psilocybin to some people and a placebo (a fake) to others. They gave exactly two milligrams of psilocybin to the study participants, though mushrooms are eaten, not injected, and don’t always have the exact same dose. 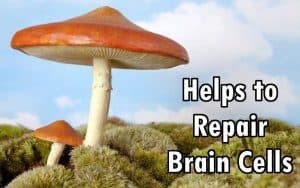 The scientists found that the people who received psilocybin had more erratic brain functioning than the control group – the neural pathways that were lighting up were unusual. However, they weren’t completely random. Instead of random chaos, the new pathways formed an entirely new organizational structure, and it has the potential to do amazing things, such as treat depression. Studies have found that people who suffer from depression have too much activity in the area of the brain that’s devoted to a sense of self. It’s important to have a moderate amount of activity in that region, but when there is too much self-criticism and negative thought, a person can spiral into depression. Since psilocybin removes old pathways as part of creating new ones, it can help people get out of a rut. The brain chatter that leads to depression – negative self-thought can be muted and lead to people having a new experience. This effect has been studied. One Johns Hopkins study gave psilocybin to a small group of volunteers, who reported an out-of-body experience. Those volunteers reported feeling more open and more appreciative of the beauty in the world – and that the effects lasted a long time. One of the participants reported feeling a sense of a greater force, and a realization that the many anxieties they struggled with were just not as important as they felt. A full year after the study, almost two-thirds of the participants said the experience was one of the most important in their lives. Half continued to be more open than they had before. While mushrooms (and psilocybin) continue to be illegal in the United States, there is definitely a possibility for future therapeutic use, especially in cases of depression.